UPTOWN — The elementary school band played "Eye of the Tiger" to get marchers in the mood. About 150 parents, teachers and students of Graeme Stewart Elementary gathered outside the school Saturday afternoon to protest any action that would close the 110-year-old building, as Chicago Public Schools has proposed. Nearly half of the school band, including 12-year-old Cortera Hampton, played the hits as marchers prepared for a neighborhood tour from Stewart to Stockton Elementary, another Uptown school set for closure. Hampton, who has played trumpet in the school band for two years, said the students and faculty at Stewart "are family" to her. If Stewart closes, students will be transferred to Joseph Brennemann Elementary, nearly one mile away. But Hampton, who transferred from Brennemann to Stewart after her third grade year, said that given the choice between the two, she'd stay at Stewart. "None of them want to go," said Reggie Spears, Stewart's music and theater teacher. "You can see them standing on the front lines to fight it right now." 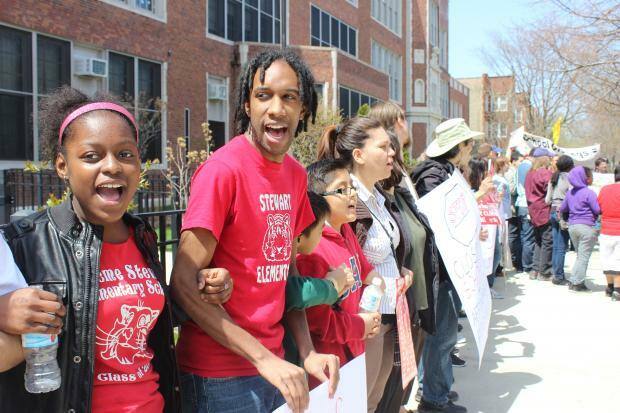 Organizers of the rally called the proposed closing of Stewart a "land grab" orchestrated by Mayor Rahm Emanuel, private corporations and Alderman James Cappleman, expressing worries that the property occupied by the school could be turned into a pricey development. The 12-minute march from Stewart to Stockton Elementary passed by several new luxury apartment locations, mostly from the private development group FLATS Chicago. Organizers were quick to note that Stewart Elementary sits in a prime locale in Uptown — within eyesight of a Red Line station and several bus routes, a quick walk to a shopping strip and bordered by a nearby Target store and new apartments. An "ongoing battle" is how poet and activist organizer Stavroula Harissis characterized Cappleman's oft-rocky relationship with Uptown residents. Critics say the alderman wants low-income neighbors out in order to make room for more affluent residents attracted by new developments. Cappleman has promised the school won't return as a charter, but a plan for the building has yet to be settled by CPS. CPS CEO Barbara Byrd-Bennett said closed schools will not be used to house charter schools. Meanwhile, students at Stewart took to the loudspeaker in chants to save their school. Spears said he'll be looking for a new job when Stewart kids are moved to Brenneman — the welcoming school already has a music teacher — but, Therese Burton, a Local School Council member of 15 years, said whichever school gets the 27-year-old music teacher will be "fortunate to have him." Burton, whose three kids attended Stewart, was on hand to support the protest even though most of her children have since graduated from college. She said she knows Spears' value as a teacher firsthand — her daughter decided to take up theater as a career path after learning theater from Spears in seventh grade. A revolving cast of adolescents were by the teacher's side throughout every step of the march. Spears, who is tenured, said he isn't too worried about finding a job if Stewart is shuttered, but one of his biggest worries is already coming true. "I will not have a job with my students," he said.